Apologies for the clickbait-y title. My question isn’t a rhetorical one intended to suggest that human population levels aren’t a problem. I don’t doubt they are. But it seems to me much less clear than a lot of people seem to think exactly what kind of problem they are, and what – if anything – could or should be done about it, which is what I want to aim at in this post. I raised these issues in my last post of 2017, which prompted some lively debate. But neither the post itself nor the comments under it quite nailed the issue for me, so here goes with another attempt. It strikes me that this response is spot on…and also entirely misses the point. It’s spot on because although plastic pollution in the oceans is an immediate problem, it has deeper underlying causes which are summarily encapsulated by the words ‘population’ and ‘capitalism’ about as well as by any others. I think it’s a bit unfair to accuse George of not being a ‘taker’, since part of the point of his article was to suggest that self-fuelling economic growth – ‘capitalism’ by another name – is intrinsically destructive of the environment. Still, it’s surely true that without large global populations subject to the forces of capitalist commodification, the problem of plastic in the ocean would be very much less severe than it presently is. But what is the ‘answer’ to the problem of plastic pollution, now that it’s there? Is it really population control and capitalism control? Suppose when the governments of the world met to negotiate the Montreal Protocol they’d said “the immediate problem of the ozone hole is caused by CFCs in aerosol propellants, but the underlying problem is population and capitalism. Therefore, rather than banning CFCs we propose to adopt a more holistic approach and exhort each member country to foster population control and work towards economic alternatives to capitalism”? Luckily, they didn’t, and the ozone hole is now a lot smaller than it otherwise would have been as a result. Doubtless population and capitalism remain underlying problems, investing other issues – such as plastics in the ocean. Again, though, are population control or capitalism control the best means we have of addressing these other issues right now? Apparently, about 90% of ocean plastic pollution arises from just ten river systems in Asia and Africa, basically as a result of inadequate waste management systems and a lack of public consciousness about waste disposal in these rapidly industrialising places1. The most efficient remedy would seem to be targeting investment in waste management systems in the relevant places. It’s not a radical strategy aimed at the underlying generative factors, but it’s probably the most effective strategy aimed at the actual problem. Generally, I’m in favour of approaches that tackle the underlying nature of a problem, but sometimes it’s possible to overcomplicate things. The main problem with plastics in the ocean is plastics in the ocean. It’s not an either/or thing, of course. Alongside strategies to reduce plastic pollution, strategies to reduce population and transcend capitalism also have their place. However, when someone like George writes an article identifying a particular issue such as this and gets the population/capitalism brush-off in response, I can’t help feeling that this is a way of relegating the problem from serious policy attention in the here and now. It would be a good thing if human population was lower than it is. But it isn’t, and it strikes me that very few of our contemporary problems are best tackled by prioritising population control as the main policy response. Certainly not plastics in the ocean. The fact that total impact varies in direct proportion with population when it’s written as a function of impact per population is a mathematical truism, but it doesn’t tell us whether population actually does affect impact in the real world. The same is true of the I = PAT formula that’s also often invoked to characterise the relationship between impact and population. These mathematical formulae are merely a priori assertions, not empirical findings of real-world relations. Let me take this example. In the 1960s the global whaling fleet was catching about 25,000 fin whales annually. We could take the fin whale catch as one indicator of environmental impact. Global human population was about 3.5 billion at the time, so the per capita impact of fin whale hunting was about one whale per 140,000 people. Population back then was increasing globally by about 2% per annum. So was the fin whale catch increasing by about 2% as well? No. Only a handful of nations were involved in whaling, and catch levels were determined by various factors that had little to do with global population. You just can’t write a meaningful, predictive per capita impact x population equation in this instance.You need to fit a theory to the data, not data to a theory. Where I = total impact, p = total population, i = per capita impact and v is a variable factor representing these individual differences in emission levels. The fact is, you just can’t infer from such a formula that I is going to vary directly with p.
Perhaps this is all an over-elaborate way of making the familiar point that what matters most isn’t population level itself, it’s what populations do – burning fossil fuels, clearing forests, dropping plastic in rivers and so on. Some populations do a lot more of those things than others. So generally speaking, v seems to me a more important variable to focus policy attention around than p.
And this is particularly true because while the population debate rages on, meanwhile – unnoticed by many – global fertility is crashing at a historically unprecedented rate, as indicated in the graph below, which shows fertility rates worldwide and for the world’s five most populous countries over the last 55 years. Those who say there’s inadequate attention to population control might do well to ponder the implications of this graph. In just fifty years, global fertility has more than halved, from an average 5.07 live births per woman in 1964 to 2.45 in 2015. In three of the five most populous countries of the world, fertility rates are considerably below replacement rate – and in fact this is true in about half the countries of the entire world. I would have thought that the trend shown in this graph would be widely celebrated by the anti-population lobby, but it scarcely seems to get a mention. True, population itself rather than population growth rate or fertility rate is continuing to rise for the time being as a result of the time lag between present fertility and its manifestation in future birth rates – there’s not much that can be done about that, short of mass murder or enforced childlessness. Fertility rates have to drop first before population rates do, just as a car has to stop accelerating before it can start slowing. But for those who say that not enough is being done to reduce population, I wonder what realistic policy measures they believe could have been implemented over the last fifty years that could have improved on this 50% fertility decline. 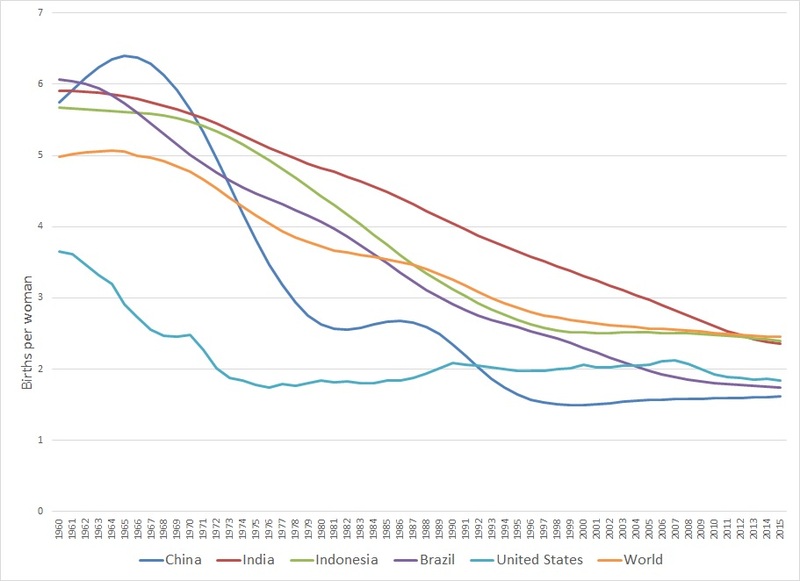 It’s worth noting that not many countries apart from China have implemented explicit population control policies, and if you look at the graph you’ll see that the point at which China introduced its one child policy (1979) came after its steepest fertility decline. So it seems that on this one, the people of the world have voted with their feet…or maybe with other parts of their anatomy…and done the policymakers’ work for them. Certainly, it would have been hard to implement official population control policies globally as effective as this gigantic act of self-implementation, and perhaps unwise too – many countries are going to face significant social problems in the coming century as a result of this demographic collapse, however welcome it may be for other reasons3. Of course, the demographic collapse doesn’t mean that our environmental and resource problems are going to magically sort themselves out. Which is another reason why the ‘problem’ isn’t really ‘population’…‘capitalism’ gets a bit closer to the mark, perhaps. The billions of people who live on just a few dollars a day certainly do have an environmental impact, but it’s really not them who are driving the drastically negative impacts in the contemporary world. However, I’d guess that the majority of them would love to live as impactful a life as the average European or North American if only they could. In that sense, globally reducing fertility rates aren’t necessarily much to celebrate. But maybe with global population set to decline in the future, there’s less need to panic about increasing crop yields, ‘sparing’ land, intensifying agriculture and all the other components of high tech solutionism that are routinely trotted out in relation to rising human numbers and pressure on earth systems. Maybe the idea of settling in to our existing local places for the long haul at historically very high, but soon to be declining, numbers might prompt some more sober thinking about the possibilities of a more sustainable, steady-state kind of agriculture. The reasons for the astonishing fertility decline don’t seem completely clear, but are largely to do with the demographic transition (declining birth rates following declining death rates) and ‘modernization’, generally speaking. So inasmuch as the line I take on this website is generally opposed to ‘modernization’, perhaps it’s worth musing on the implications of a small farm future for fertility rates or future population levels. Against the notion that peasant farmers always have high fertility, the evidence suggests that in situations where population pressure on land is a limiting factor (which could well be the case for a lower energy, small farm future in a country like Britain), people attempt to keep their fertility levels low4. But high fertility can look like a good idea if you have no means of supporting yourself in old age and/or you or your children are unlikely to be able to attain a secure livelihood. So if I were responsible for social policy in a resource-constrained country of small farmers in the future, I think I’d prioritise primary health care for mothers and infants, social care for the elderly, and educational/job creating opportunities for young people. Doubtless this would pose many challenges, but on the upside they’re all people-intensive rather than energy or capital intensive projects, and that’s where the true wealth of human societies lies. I’m in no position myself to lecture anyone about the evils of human fertility but here’s a final thought: there’s something quite odd historically about societies that deem having children to be a bad or irresponsible choice on the grounds of environmental impact, without attending more directly to the nature of the impacts themselves. I have no idea how that’ll pan out, since there are so few historical precedents. My guess is that while other countries will try to ape the high-consumption low-fertility western style, not many will succeed and in the longer term that high consumption low fertility style will go the same way as other weird religious cults of the kind that emphasise celibacy and service to some jealous and demanding god. People will get old, the freezers containing the corpses of the transhumanists will run out of juice, the trinkets will lose their lustre, and ultimately our societies will be replaced by ones that are better able to farm and function at sustainable levels of energy use by attending more to v and not so much to p in equation (3) above. Schmidt, Christian et al. 2017. Export of plastic debris by rivers into the sea. Environmental Science & Technology. 51, 21: 12246-53. Netting, Robert. 1993. Smallholders, Householders: Farm Families and the Ecology of Intensive, Sustainable Agriculture. Stanford UP.